How Can We Bee … Helpful? by A Guy Called Bloke and K9 Doodlepip! It’s not rocket science it’s just awareness – simplicity itself – what would you rather Bee Dead or Bee Alive – personally l think l would prefer living bees to dead bees and the bees probably agree with me! How BEE friendly are you? With Spring just literally on our doorstep now, although even l have to concede at times that in the UK alone, it appears that Mother Nature has withdrawn it … our bees are back into their daily routines. The garden l have here, is not a gardeners’ delight, we have wild herbs growing next to wild flowers, and very soon we shall be planting out our seasons’ rotation for vegetable growing. I tend to like to see more ‘weeds’ and don’t see them as such but more as flowers in the wrong place, it sounds kinder that way. Read the full article with lots of wonderful photos here: How Can We Bee … Helpful? — A Guy Called Bloke and K9 Doodlepip! Lots of articles speak to the beekeeping year beginning in August or early Fall. Yikes, that’s now! If you harvested in June then you probably fed your bees through the dearth. If you waited until now to harvest you probably got less honey but you saved the costs associated with feeding. Either way, now is the time to build the best bees you possibly can for the winter. I know it’s still hot but get back in there on the next reasonably nice day and assess them. You don’t really have to take every frame out and make them upset but get an idea of what they have. 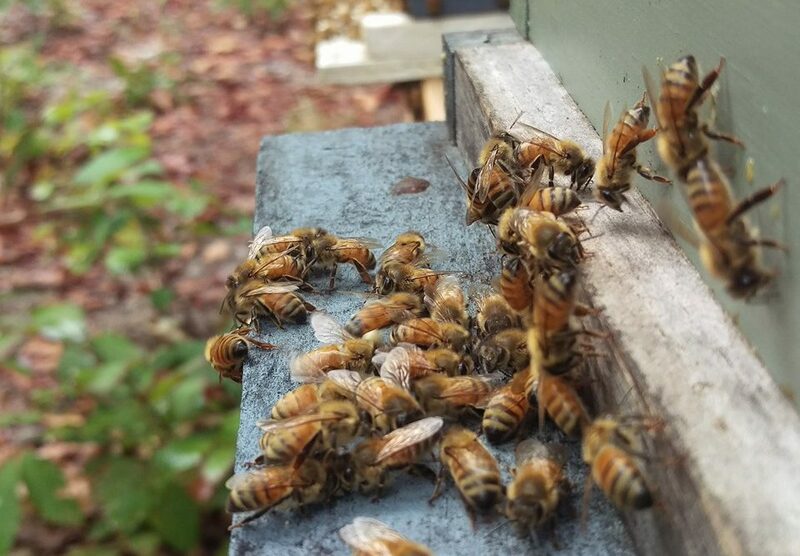 Look for capped and uncapped brood, pollen, and honey stores. And start picking up the back of that hive and compare it to what you see inside so you learn what’s heavy and what’s not. We’re on the cusp of the Fall flow and soon your hive will start to stink from goldenrod pollen. That smell should bring a smile to your face as they are making preparations for winter and raising fat winter bees. Some of you may have more honey than you need, others will see some empty comb. Read your hive and, like an artist, choose your tools to create the ideal hive for overwintering. Most beekeepers assess and treat for Varroa after they pull honey whether that was a couple months ago or now. You want to do everything possible to increase the health of your bees now so they, in turn, raise strong winter bees over the next two generations. Sickly bees build sickly bees; strong bees build Arnold Schwartenegger bees. You want Arnold on your side when the temperatures are 20 degrees in January and the pantry is waning. Beekeepers that started this year will reach the pinnacle of their beekeeping in March 2019. Then they will have bees-a-plenty and the race to stay ahead of the bees becomes an exciting and enjoyable problem. Using this year’s drawn comb they will explode. The bees will be saying, “Scotty, give me all you’ve got.” and you’ll be saying, “Captain, I don’t think she can take much more! She’s gonna swarm!” (pardon the paraphrase). But, back to the topic at hand – building better winter bees. Time now to step up your game one more time before we enter the long dull days of winter. Although most days in the Midlands of South Carolina allow for the bees to fly they won’t be flying much because there won’t be anything out there. And you’ll be stuck inside wishing for Spring to come and waiting for that first Red Maple bloom, or with your ear to the side of the hive listening for their hum as they convert honey into heat. So, assess them now and and get them flying towards a hive full of strong winter bees and a hive filled with lots of stores for the long winter ahead. Go for it! Build better bees! Picture: Early Spring bees. Notice no leaves on the trees yet. The cold weather is here, You’ve done what you can to tuck them in for the coming season. So, what are you going to do with all your time now? 1) Continue to lift the back of your hives to check for weight. Now is why you learned this method of assessing stores. 2) Perform maintainance on honey supers pulled off hives – painting or otherwise. 3) Assemble new equipment for next year – boxes, frames, stands, etc. 4) Order packages, nucs, or queens. 5) Plan for changes you’re going to impliment next season. 6) Call, visit, or write farmers or landowners where you’d like to place hives for out yards next spring. 7) Attend local and state beekeeper meetings. 8) Scout trees for placement and prepare swarms traps. Construct swarm capture bucket. 9) Build a nuc now to keep in your car or truck for community swarm captures next spring. Register with on-line swarm call lists. 10) Order or ask Santa for a copy of that beekeeping book you’ve been wanting to read. Read some every day. I guess before we plunge into the content it might be best to say exactly what is planned. The bees must make their own way in some form or the other. A paraphrase from a favorite movie of mine: “They have to pay something, don’t they?” Historically, not so very long ago, the bees paid their owner, if you can say you own bees. Honey bees as livestock could make the farmer a living at one time. Things have not gone well for the bees though and we are faced with difficult times. A sideliner beekeeper with a few dozen hives is faced with having too many expenses without enough income from the effort. And honey alone might be enough to pay the costs associated with maintaining and feeding the bees but is that the sum of the venture? So the beekeeper, in my estimation, is faced with multiple challenges to both increase marketable products and reduce expenditures. Some ideas which come to mind are specialty products of raw, unfiltered honey, comb honey, wax, propolis, pollination services, queen sales, nucleus hive sales, and pollen. Cost cutting through sustainable methods by rearing queens in house, in house woodenware manufacturing, and making seasonable splits to maintain a steady supply of bees for use in multiple bee yards. I hope to be able to speak to the many facets of sustainable beekeeping and the seasonal chores associated with maintaining healthy bees. I’d also like to be able to publish a seasonal calendar for use by others as a guide for their own beekeeping tasks. And finally I’d like to somehow transmit to others the art of beekeeping as I have learned it thus far. It’s one thing to read the books and memorize the tasks, but learning to read and interpret the pulse of the colony by careful observation is more challenging. Utilizing all of the beekeeper’s senses to draw correct conclusions, assess, develop a plan, impliment, and evaluate the process based on observation and intuitive skills.